Panoramic Ocean View! Stunning Sunsets! 1200+sf 2BR/2BA luxury vacation resort condo decorated with exceptional style. Steps from the beach on Maui's sunny south shore in Kihei minutes from the Wailea resorts and shops. From our lanai, we have panoramic ocean views spanning from the crescent island of Molokini, to Lanai, to the West Maui Mountains. See spectacular sunsets in a beautiful setting. During the winter months, watch whales while sitting on the lanai. Maui Kamaole is a lush tropical complex with 2 pools, tennis court, and beautiful landscape on 23 acres. My husband and I live in Oregon. We both have a love of the ocean and we have purchased condos in great beach towns along the beautiful Columbia River. As a means of satisfying our desire to live near the water. Maui has always been at the top of our list of places we enjoy so it was natural for us to find a home on the island we have come to know so well. We definitely believe that 'Maui no ka oi' Maui is the best! We have always enjoyed the beaches of South Maui and fell in love with the beautiful grounds of Maui Kamaole. Even today, when I walk into H-208 I say WOW as I look at the view! The sunsets are truly spectacular. The close proximity to one of the best snorkeling/family beaches is awesome. The property has 2 pools and a tennis court. It's within walking distance of restaurants and shops. This our third stay in the Maui Kamaole complex and we love this location. This second floor unit had a terrific view of the ocean from the lanai and the master bedroom and it was a very quiet unit. Some of the furniture and carpet could use an update, but the kitchen is so well stocked with dishes, glassware, pots/pans, utensils, and the view so nice that we would definitely stay here another year. The grounds are beautifully maintained with lush landscaping. This condo is in a great location. An easy 5 minute walk to the beach or 1 minute drive away (parking is easy and spaces were always available when we parked at the beach). If you are looking to explore all of Maui, this spot in Kihei offers a great central location to get everywhere. The space is clean with a fully stocked kitchen with all sorts of cookware. If you are a coffee lover it even has a coffee grinder. We did not do too much cooking as we wanted to explore the food scene in Maui. For the $587/night after taxes and fees a few upgrades would be appreciated. We realized the island is expensive overall and for the money the space was good, location great and the condo even has a nice large washer/dryer and pretty views of the ocean. A few things that would make this spot 5 stars would be to purchase new sheets/comforter/towels. We found the bath and beach towels to be old hotel towels, small and some fraying. The sheets and comforters seemed older and were thin and the elastic worn, every morning we had to remake the bed. Wen was a great host however, a quick communicator and offered a flawlessly smooth checkin process. Overall, great location, fully stocked kitchen, easy parking and beach access and pretty views from the balcony. The condo was awesome and had everything we needed. It was very spacious and comfortable. The kitchen had everything we needed. There was an extensive amount of beach toys, snorkels, boogie boards, chairs, umbrellas, and towels for us to use. BBQs just outside the unit. The views from the balcony were spectacular. Very easy and short walk to the beach. The owner Wen was great and easy to work with. We'll be back! We had a wonderful stay in your condo! We are a family of 5 (3 children ages 10, 9 and 8) and felt very comfortable! This was our first time to Hawaii and we didn't want to ever leave! -In addition to the king bed upstairs (and downstairs too), they have an air mattress which came in handy for our youngest child. Lots of extra sheets/ pillowcases too. -Balcony overlooking the ocean was a highlight! - Thankful for the beach towels, small cooler, sand toys, boogie boards other outdoor activity equipment provided. 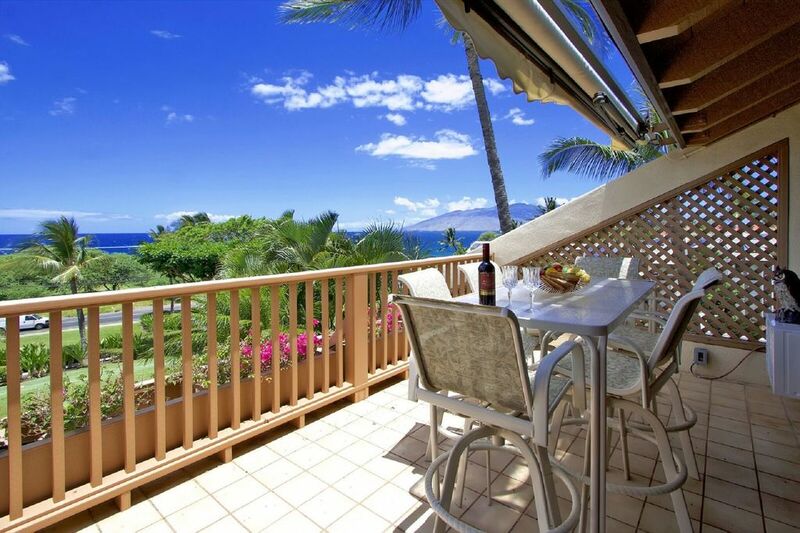 - VERY easy walk to the Kamaole beaches and to stores/ restaurants nearby. We walked the beach most mornings and evenings. -The condo grounds were beautiful and well-kept. Easy to walk to the pool. -Really it is the BEST location to drive anywhere on the island! We visited 7 different beaches, drove to Hana, up to the volcano, to a Luau in Lahina and to the port for a snorkel boat trip. - HIGHLY recommend the city of Kihei! It is very residential and everything is convenient from this area of the island. We visited so many areas and loved ours the best. We had one issue with the coffee pot, but the owner was responsive and had a new one to us within the same day. Thank you from these two huge coffee drinkers! -If doing the road to Hana, stop at the coconut Ice cream shack about 1/2 way there. It was worth the stop/ money. We would definitely stay here again! We loved waking to the beautiful view. The condo has plenty of space for a family to enjoy a week or more on this amazing island. Great location and awesome views! Being our first time to Maui, I wanted to make sure that we had a good first stay. This condo was excellent. Exactly like the pictures. Great location, minutes walk to the beach and within walking distance to restaurants, bars, and shops, but still quiet and peaceful enough to enjoy the scenery. The condo was clean, well outfitted, and comfortable. Plenty of space. The owner responded to my many phone calls and was quite helpful. We are hoping to make this trip a frequent one and wouldn't hesitate to stay here again. Thanks! Great location, amenities, and views! We loved our stay. Rates are subject to change until reservation is confirmed. There is a 2.5% processing fee if you wish to pay by credit card. There is no processing fee if you pay by check. Cancellation Policy: No refunds for cancellations made after any payment is made.